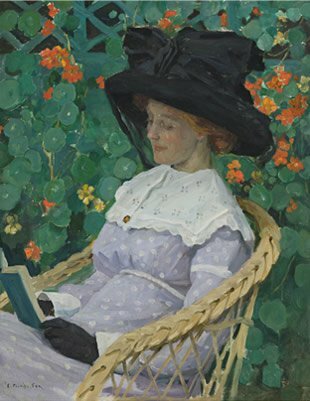 In honour of Margaret Olley, the Art Gallery Society of New South Wales, on behalf of the Art Gallery of NSW, has acquired an outstanding painting by Emanuel Phillips Fox, entitled Nasturtiums . Emanuel Phillips Fox is renowned as the author of many of the most sumptuous, cosmopolitan and splendidly coloured images painted by Australian artists in Europe at the turn of the 20th century. Nasturtiums belongs to a creative period, from around 1909 to 1914, and is acknowledged as one of the finest in E Phillips Fox’s oeuvre. It is the most significant in a series of women-in-garden paintings which Phillips Fox created over 1911–12. Many of these exhibited his use of reflected and dappled light as decorative patterning, and were painted in-situ in the small central courtyard garden of the Fox studio-apartment on Boulevard Arago, Montparnasse, Paris. ‘ Nasturtiums is a superb addition to the Gallery’s collection and joins major paintings from the Edwardian and belle époque era by expatriates Rupert Bunny, John Russell, Ethel Carrick Fox and Phillips Fox himself. Margaret Olley would have loved this painting as Phillips Fox was one of her favourite artists,’ said Edmund Capon, director, Art Gallery of New South Wales. ‘The acquisition of this painting, in memory of Margaret Olley – who loved Fox’s works – is the Society’s and its members’ contribution to honouring both these great Australian artists,’ said John Masters, President, Art Gallery Society of New South Wales. The painting was featured in the recent major exhibition Art Love & Life: Ethel Carrick and E Phillips Fox at the Queensland Art Gallery and was a gift to the subject of the painting, in whose family it has remained. The model for Nasturtiums was the young Australian artist Edith Anderson who stayed with Ethel Carrick and Emanuel Phillips Fox over 1912 and became perhaps Fox’s favourite model. Certainly many of the artist’s paintings of women in gardens in these years carry Edith’s signature red hair. Phillips Fox introduced Edith Anderson to his artist-neighbour, Penleigh Boyd, whom she subsequently married. Their son Robin Boyd, an eventual owner of the painting, became one of Australia’s most renowned architects.